Right off the bat, I have a confession to make: I do a weekly question and answer radio show and the idea of having ONE book that can tell me how to grow practically everything, well, it would be a dream come true. I could look up the answers during station breaks and then come back on the air looking pretty darn smart with a researched answer. One book for growing practically everything! Wow! Unfortunately, How to Grow Practically Everything isn’t that book. In fact, it’s a disappointment to see how little “how to grow” information there actually was in the book. While not a book for the beginning gardener to learn how to grow plants and clearly not a growing guide in any sense of the word, it is true to the second half of its title, 100s of Gardening Projects Absolutely Anyone Can Do. In fact, it is one of the best project books I have come across of late. How to Grow Practically Everything does contain a terrific amount of horticultural information—it is just hidden among all the projects. There are, indeed, 100s of gardening and landscape projects, from growing herb gardens, summer baskets, landscaping with shrubs to taking cuttings and growing orchids, making an obelisk for those climbing vines and creating a Monet-style garden. Instructions are complete with step-by-step color pictures that each speak a thousand words. This is a good thing, too, because the text is sparse. Still, the combination really works. The problem with How to Grow Practically Everything, besides its misconceived title, is that you really have to study the book to find projects you might want. There are lots of them, but obviously not everyone is going to appeal to every gardener. Its the kind of book you might stumble across at a bookstore, flip through the pages and because of the beautiful and clearly instructive pictures, instantly see several ideas that would work in your yard. Then you have to decide if there is enough for you to purchase it. In fact there is a tremendous amount of useful information. If you are new to gardening, it will make a great supplement to real “how to” grow books. If you are a do-it-it yourself landscaper, and want some direction, then How to Grow Practically Everything is a good buy. The pictures are all color and each project is a lesson in some aspect of gardening. This is what I call a “winter gardening book,” something for a gardener to read when she can’t get her hands in the soil. It is also a planning book, best read when you have time to contemplate, take out the sketchpad, and search through catalogs. There are at least a half a dozen projects that will inspire any gardener and even the projects that are not useful to you are presented in such a manner as to impart useful information nonetheless. 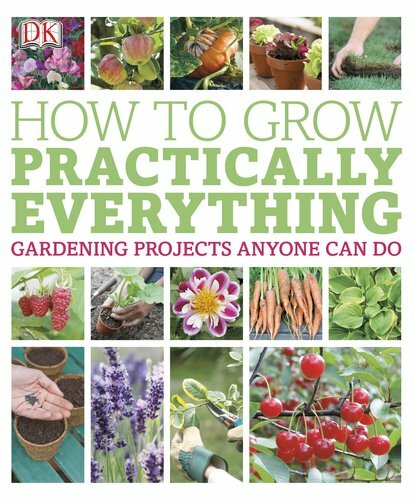 It just isn’t a “how to grow everything” book as the title suggests. If you want to learn how to grow things, this is not the book you think it is. If, on the other hand, you want some really neat projects that don’t cost a leg and an arm, can be completed in a few hours, yet yield professional looking results, forget about the title and check it out anyway.